On the left are Moira’s health hands. 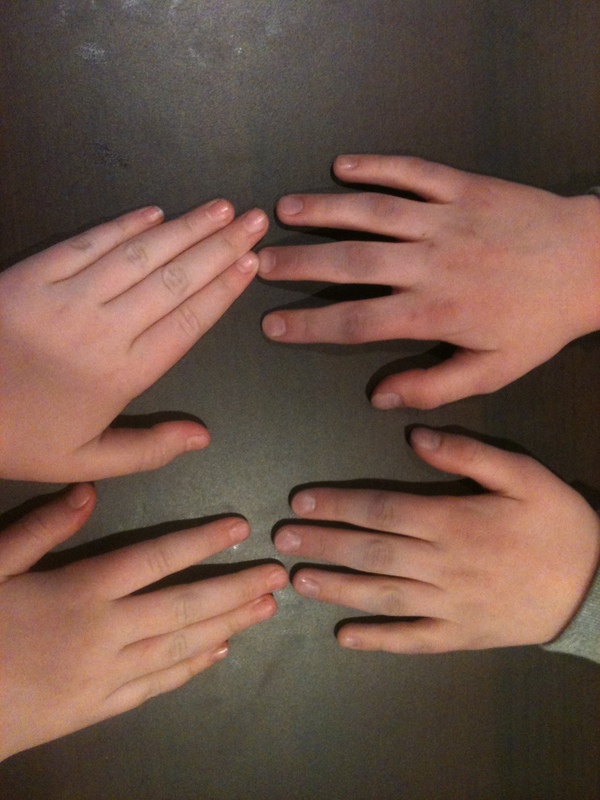 Plump, pink, little eight-year-old hands. On the right are Liam’s hands. See the bands of black at his knuckles? He’s apparently fine, though I will be calling his cardiologist in the morning. His hands, after a long warm bath, are no longer black. He had chest pain today, in his sternum. . . which has been sawed through five different times. I think that’s a bone break pain in response to cold. Yesterday it was 82 degrees here at 4:00 pm. By 5:30 it was 45. Today it was about 37. It should snow in the next 24 hours. We live at close to 5000 feet above sea level. These are not ideal conditions for a kid with half a heart. Liam’s blood works differently than mine or Moira’s. Liam’s blood uses gravity to get around half of its route. So, a sudden and severe change in barometric pressure and temperature is not an easy adjustment. We’ve seen Liam turn purple from spending time in a swimming pool, so I guess I shouldn’t have been so surprised today. Yet, I was and beyond relieved when the warm water brought him to the same place that the rest of us take for granted. . . I take nothing for granted when it comes to Liam or being his mom. I will call the doctor tomorrow to test my theory behind the mystery of the black knuckles. I will do due diligence, but for now I am enormously relieved at the return of flesh toned fingers. The life of a Wyvern mom is stretches of gratitude punctuated with gasps of fear and deep sighs of relief. I love my life. I love my life. I love my life. . . sigh. The sternum aches and pains. Yes! Natalie gets that, too! Especially on cold snowy days 😦 so happy to hear that Liam’s beautiful pink color returned and that cardiology gets answers. Even your kids’ hands are cute. For a quick sec I thought of James and Natalie with that photo. Heart hugs to you! It was the same with Steves hands,even here in warm SC.His was due to having only 75% oxygen in his blood. Kaston was having episodes of where he was having “chest pain” and pressure in his chesr. Our cardiologist in Dallas said it was more than likely growth in his sternum causing pain. When their bones are surrounded by scar tissue, it has to stretch along with the growth of the bones, so it sometimes can feel like pressure or chest pains. Sure wish I woulda known that previously! As for the knuckles, you got me! And we’ve also discussed the paleness, and when the color drains completely from his face, with a greyish tint to it. He’s done that since forever…with no explaination. Apparently that, too, is a Fontan thing that they don’t know for sure why it happens. Hope you figure out why his knuckles turned black! But I’m sure it will be the normal answer to our questions of random things we see in our kids…not sure, just keep an eye on it! Looks like Raynauds, Amanda, but what I really noticed was how close in size Liam’s hands are to your own. Kid’s growing!